This article first appeared in Personal Wealth, The Edge Malaysia Weekly, on April 2, 2018 - April 08, 2018. PMB Investment Bhd secured four wins at The Edge-Thomson Reuters Lipper Fund Awards this year, marking a great comeback from the three awards it won two years ago. 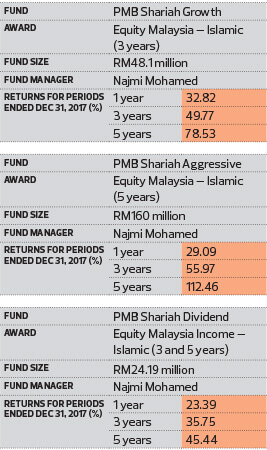 The winning funds were PMB Shariah Growth Fund for Best Equity Malaysia (Islamic) in the three-year category, PMB Shariah Aggressive Fund for Best Equity Malaysia (Islamic) in the five-year category and PMB Shariah Dividend for Best Equity Malaysia (Islamic) in the three and five-year categories. CEO Najmi Mohamed attributes the achievement to the improvement in the fund house’s two-level screening investment process and disciplined approach to its investment strategy. PMB will stick to its investment process and strategy despite expectations of higher volatility this year and only make changes to its portfolios if necessary. This year is expected to be more challenging than 2017, says Najmi. The market is expected to be choppy in the first half, due to the uncertainty surrounding the 14th general election, before stabilising in the second half. Among the main risks the fund house is observing are higher inflation, rising interest rates, weaker growth in major economies, global trade disruptions, geopolitical risks and possible trade wars arising from protectionist policies, says Najmi. “We will assess every risk. If any of them affects our equity holdings, we will reposition our portfolios accordingly. PMB’s unit trust assets under management increased 44% last year, benefiting from the performance of its portfolios. Meanwhile, the net asset value of the winning funds — PMB Shariah Dividend, PMB Shariah Aggressive and PMB Shariah Growth — rose 254%, 65% and 56% respectively. PMB finds the oil and gas and construction sectors attractive this year, says Najmi. Judging by the better earnings performance of oil and gas companies recently, the fund house believes that the earnings of the overall sector bottomed out last year and expects it to deliver more positive surprises going forward. In the construction sector, PMB anticipates a higher value of job flows this year, owing to the rollout of major infrastructure projects such as the Mass Rapid Transit 3, East Coast Rail Link and the KL-Singapore high-speed rail. According to the Construction Industry Development Board’s report that was published in October last year, the value of construction projects awarded was estimated at RM170 billion last year and RM180 billion this year. The fund house will avoid the media and publications sector due to unexciting earnings. It will also avoid the cement sector, which is operating in a challenging environment due to prolonged pricing competition arising from lower domestic demand. PMB plans to launch its first shariah-compliant Asean fund by the middle of this year. The fund will focus on companies in the region with good earnings growth potential that are trading at attractive valuations. “We believe there is a market for the growth opportunities in Asean and there is also a demand for such products. The fund is suitable for investors who want to expand their focus and diversify their investment palette into the region and achieve capital growth over the medium to long term,” says Najmi.